Well, well, well, even at my time in life there’s still much to be learned. For instance, I did not know that Carolyn Keene, author of the Nancy Drew mysteries, wasn’t an actual person but instead a syndicate a la the Alfred Hitchcock and the Three Investigators authors (the key difference being that they never put any author name on the cover). Additionally, I did not know that the first 34 Nancy Drew books, published between 1930 and 1956, were revised by other ghostwriters from 1959 in order to amend the characters and adjust their attitudes perhaps a little more sympathetically. Much like Young Robin Brand, Detective (1947) by Freeman Wills Crofts, this bespeaks of a growing sense of what was to be achieved in the writing of novels for readers in the age group now generally categorised as either YA or MG depending on which side of the Atlantic you hail from (editor’s note: other countries are available). So before we even get to the book itself there’s already a lot to unpack. The Secret of the Old Clock (1930) is, then, the first ever Nancy Drew mystery, written by Mildred Wirt Benson who — much like Robert Arthur with the Three Investigators — was responsible for the first slew of Drews. My edition pictured above is the Grosset & Dunlap 1998 printing of a text revised by Harriet Adams in 1959 and so it is this later version of the book that is the focus of today’s post. For the curious, a rundown of the differences of the two editions can be found at Wikipedia. As with Crofts’ novel, this edition contains several original drawings that I’ll use to illustrate this post, and there’s the additional similarity that once again the artist is uncredited (and the pictures unsigned), so I’d value any insight anyone can offer. I doubt these pictures were the from the original 1930 edition because some of them feature aspects of the plot which seem to have been added by Adams, and to me there’s something indefinably 1950s rather than 1930s about them — the clothes and the haircuts all feel to my mind more aptly placed in that later decade — though, as ever, I’d love to be corrected if this surmise is in error. As for the plot…well, there we come down to one’s definition of ‘plot’. A series of events happen to a cast of characters who crop up one more than one occasion, but really that’s only the basest attempt at plotting anything. This is really rather more of an aimless meander through a set of closely-packed happenings that steer Nancy towards a conclusion that she’d never otherwise reach, plotting by deus ex machina, even if the “young sleuth” does come out of it rather better than that description would imply. We’ll not kid ourselves that this is some sort of pre-feminist tract but, once you take away the elements of this book which have not made their presence felt as positively as they might, its portrayal of Nancy actually gives us a young, proactive woman who would have probably been something of a progressive idea at the time. It all starts when Nancy, driving “her new, dark blue convertible” sees a young girl wander out into the road ahead of a truck. 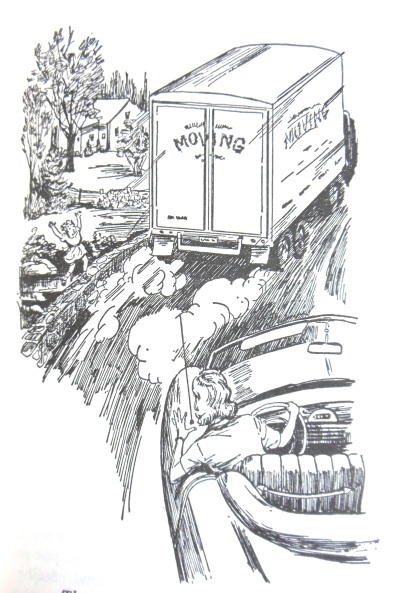 The girl is miraculously unharmed, and Nancy intervenes long enough to return her to her guardians — a pair of elderly sisters who realise the truck drivers have robbed them under the guise of buying some furniture. The sisters, see, are hard up, having expected a windfall from an elderly relative in his will only for his estate to be revealed as left to the wealthy (and, by implication, less deserving) relatives with who he lived for the final few years of his life. Nancy is intrigued, and proceeds to run into just about everyone in the world who knows this story and has an opinion on the will and its validity. As a mystery, it falls rather flat, since Nancy is so gosh-darned privileged and self-righteous that everything simply bends before her when it’s not busy falling in her path. Case in point: chapter 3 is called An Unpleasant Meeting, and in it we know Nancy and her legal eagle father have conspired to meet with another lawyer who it is rumoured might know something about this will and the family behind it. The unpleasantness of this meeting, then, should come when Mr. Drew asks his fellow professional to divulge legally-privileged information about the existence and contents of a rumoured later will that would see the money go to other people and this second legal gentleman rebukes him for making unethical demands, and refuses to help. Not so. Instead he looks around the restaurant, leans in and goes “Well, Roger, just between me, you, and your highly-inquisitive eighteen year-old daughter, here is the exact information you want…”. Then Nancy bumps into the snotty teenagers who are due to inherit the money and they rip a dress in a shop that Nancy is able to then purchase at a knock-down price — and that is the unpleasant meeting. This sort of thing pays off time and again: upon learning that she needs an excuse to go out to the isolated location where the family in question have a holiday home, she is immediately invited in the next paragraph to a summer camp that’s literally on the opposite shore of the lake she wants to visit. And the mystery reaches fever pitch about a third of the way in when an elderly lady who thinks she might remember something about another will is suddenly caught transfixed — in the middle of talking about how the will could be hidden somewhere — by the sight of an old clock, but then can’t think why this might be relevant. And the book is called The Secret of the Old Clock. Hmmm, what do we think, gang? “There must be some clue I’ve overlooked” Nancy thinks to herself at some point…and, well, for the frank defamation of the word “clue” I may never forgive this series. Part of the difficulty I have, too, is that the people Nancy is acting for — the good folk who just want to money for decent reasons, rather than the bad folk who want to money simply to have more money to buy dresses and shoes — want the money for things like singing lessons from a world-famous vocal coach and to go on round the world cruises. Mary and Edna Turner wanting financial security to provide for young Judy is laudable, but the others are as avaricious in their own way as the people we’re meant to root against. And, yes, it’s a book for young ‘uns, I know, but what to them is future financial security? The one motive herein that encourages any sympathy will be lost on anyone who thinks being taught to sing is laudable as a reason for need lots and lots of ready lucre. Much woolgathering ensues, with everyone imagining how wonderful life would be if they had money and Nancy feeling it oh-so-keenly despite her huge house, loving father who is able to give her a car, attentive and caring housekeeper who loves her like a daughter, and middle class friends who can invite her at no cost to stay at their conveniently-located summer retreat. YA fiction from this era was certainly not a champion of the underdog, it has to be said: it was a few years yet before the comfortably-off children of middle class families stopped being the child protagonist of choice. There’s a point of sociological perception to be made here and, even though this is not the blog to make it, it’s a fascinating study to consider how many adventures in books seemed to be the preserve of the what-ho jolly rowing and Cook has made us all some sandwiches crowd. Identity and representation gets less necessary in reading as one ages, but it’s easy to believe that — for all the efforts made with these early YA books — a lack of relatability in this era put more than a few youger readers off. Nancy, though, is actually quite likeable. Oh, sure, others may complain she’s rather too much of a Mary-Sue, but I admire the unshowy practicality with which she replaces car tyres, fixes boat motors, pursues lorrys down dirt tracks, and throws herself into said lorry for a spot of felonious search-and-pilfer while the men who are responsible for the initial theft eat nearby. The slightly more thrillerish elements of this work very well, in fact: Nancy confronting thieves only to be locked in a wardrobe (attempting to pick the lock with a bobby pin being about the only thing she fails to do successfully in the entire narrative…) and then escape, rush to the police, and give chase. It’s a great little sequence which brings the determination of the character to the fore and at least partially vindicates the interest that was shown in these books — I can’t believe there was much like this around in 1930, children (and particularly girls, if Enid Blyton and her peers are anything to go by) typically seen and not heard when this sort of endeavour came a-calling. This is another wonderful glimpse into the origins of this sort of undertaking, however, and all the more fascinating for the chimerical way it was then reworked so as to better fit (one presumes) the expectations of the young boys and girls whose needs had become more keenly understood in the years between Nancy’s genesis and rebranding. If she was yuppified slightly to raise her appeal above that of the rabble, the nevertheless remains the core principle of helping others in a selfless way (however misguidedly that principle emerges in the text), and in going about this in an independently-minded, determined, and rigorous way I can well believe the character will have paved a lot of roads for much that was to follow. Back in the 70s I was a big fan of the Three Investigators, grabbing whatever I could from the library van when it visited – I grew up in a small village and that was the only access – and then whatever editions I could find in shops on visits to the next town. I also got in the Hardy Boys around the same time but they were closer to adventure thrillers and less satisfying for me. Back then all these books wee published in fairly uniform hardback form by Collins in the UK and so I also picked up Nancy Drew books on occasion, even though they were aimed more at girls the books looked good and some of the titles were eye-catching. I don’t know if I ever read this one but, generally, I have memories of the mystery element being a bit stronger in that series than was sometimes the case with the Hardy Boys books, but weaker than the 3I books. Having read zero Hardy Boys and only the first two Three investigators, I can wholeheartedly and with a clear absence of authority say that you’re definitely right. Doubtless both series hit their grooves after a few volumes, but the mystery elemtn here is virtually non-existent, devolcing into a series of thrillerish chase-and-capture scenes that, while entertaining, weren’t difficult to plot and couldn’t have provided too much challenge to rework. And having read most of the Hardy Boys stories and all of the Three Investigators ones, I will also concur. I haven’t read many Nancy Drew novels, but there were a few where she teamed up with the Hardy Boys, so I’ve read a couple of those. I think because Nancy Drew were girls’ books and the Hardy Boys were geared towards boys, there is more action in the latter and perhaps more cerebral stuff (for lack of a better term) in the former. But compared with 3I, they fall very, very short. There are certainly action sequences in the Three Investigators stories, but they were always much heavier on logic and making deductions. That’s very much the impression I’ve been give from reading about THB/ND vs. T3I. Which is why I went all out when I found 20 T3I books recently and only bought this one Drew… Thanks for reiterating that this is indeed the case. I was a big fan of The Three Investigators as a kid growing up in the eighties. I may have read one or two Hardy Boys books, but they struck me as “old fashioned”. I assume both series were written at roughly the same time, so it’s curious that The Three Investigators resonated with me while The Hardy Boys didn’t. My memory is hazy on all of this, but I think that with The Three Investigators, the mysteries really stood out and engaged me, whereas with The Hardy Boys, it was the “this is a time long before you were born” element that really stood out. Of course, as a kid, I didn’t really appreciate the history of it all. My sister had all of the Nancy Drew books, but I’m fairly certain I never even touched them, having classified them as “girl’s books”. I’m intrigued by the notion that they were updated once to remove certain unsuitabe thigs…and then again to remove something else that had become unsuitable…and then again to occlude another questionable and dated reference — man, what the hell were these books like to begin with?! They were dripping with period detail and filled with casual racism . . . quite like the books we read on a daily basis. I have read one piece of GAD which legitimately uses a racial slur as a clue in part of the narrative. No, I shall not name it. But it won’t be getting a major publishing house reprint any time soon, I’d wager. The authorship of the Nancy Drew books is an interesting topic and resulted in a court case a couple of decades ago. This first book and several of the ones that followed were written off a chapter-by-chapter outline from Edward Stratemeyer. As the series progessed those outlines became sketchier and simpler. Girl Sleuth goes into much more detail and is, imo, a little slow but I agree it is interesting to see how the publishers tried to make small changes or start new ranges to fit the character to the times. I would agree that these are generally adventure stories rather than mysteries. There are some adventure computer games for teens produced by Her Interactive based on the books that are cute. The Old Clock one was produced in an anniversary year and is done in period style. Were the prospect of these books more inviting, there’s definitely enough going on in back of them to make for an interesting bit of internet research…but I think I’ll just suffice with being moderately interested and stopping there — a raise of the eyebrows, a purse of the lips, a double nod, and no more. It is fascinating to consider how these were actually written, though, I had no idea it was so involved, so thanks for bringing that up. Oh, I do want to recommend a couple of games to you — the game based on Murder on the Orient Express is, I think, worth the many hours it will take you. If for no other reason than the solution is … extraordinary and at least one of the puzzles I defy you or anyone to solve unaided. (It involves manufacturing a battery out of household objects.) The framing story is interesting, the inventory management system is interesting and innovative, and the artwork is beautiful. The games based on Nancy Drew are interesting but many of them contain an unpleasant segment of what I think of as “grinding” — you have to accomplish a repetitive task over and over in order to continue playing, for no reason connected with the plot. I really enjoyed the game based on And Then There Were None but many Christie fans will be outraged at what’s been changed, which is to say everything. Call it a very very very loose adaptation — okay, they kept the title and the island. The one based on Evil Under the Sun is “okay” and most of the rest of them are not very good. The “hidden object” games like Peril at End House are awful. I have a huge soft spot for the Nancy Drew games though because I get to play those with my wife and, no doubt, I’ll introduce the books to my daughter when she is older. It is amazing how many books Ed Stratemeyer was pumping out which may help explain the comparative simplicity of the plot. Bet he still didn’t rake in as much moolah as James Patterson, though. From what I can tell, the computer games based on Christie novels are all horrible: mostly based on searching for items, rotten animation, not worth the time. I would prefer a game that was based on the spirit of an author rather than on the actual cases. How many variations of a solution to Orient Express could there be – at least any that would in any way match the special qualities of the original?? We should develop a game based on the spirit of JDC’s work: a series of who/howdunits starring Gideon Fell that would mesmerize and baffle millions of players and net us beaucoup pounds!!! Dan and Ben can help. We’ll set it up in your garage. Excuse me, sir — we English don’t have garages, we have sheds. You keep your cars in a shed?? Then where do you keep your rake? Oh, and Kate talked about an Orient Express BOARD game at my post, so there IS something to be excited about!!!!!!! The rake goes in the Rake House. Like a shed, but…rakier. They’re mentioned In Christie all the time. Oh, unless you’ve only read the expunged versions, that is. I feel like now is an excellent time to make another attempt at getting you to play Her Story, which is extremely the opposite of the frustratingly linear detective game. Someone today compared the Sherlock Holmes: Consulting Detective game to it when I wanted to know more about that boardgame, though I’ve not played the boardgame end of that comparison. Have you tried to get me to play this before??? Because I don’t think I’ve ever heard of it. I just looked it up, and I read as much of the Wikipedia article as I dared for fear of spoilers. Is it great?? There was another game for one of the Xbox type systems that was also a murder mystery. It had the word rain in the title, and it was supposed to be very moody and very good. Honestly, though, I have avoided buying any system like this because there are so few titles that interest me . . . and because i don’t want to become like one of those weird characters you see all the time on Law and Order: SVU!!! Look, if people are going to keep recommending these things that sound awesome I’m going to have to quit my job to have enough time to do them. And I don’t think anyone wants to contribute to a Patreon just to pay my bills so that I can fart around on fun stuff for the rest of my life. Oh, darn! And here I was going to start the NS series from the beginning and then plod right on through to the end! I read one or two of these as a kid, but I was a Hardy Boys reader until something better (*koff* *koff* Agatha Christie *koff* *koff*) came along. Given when I grew up, I definitely read the “Rewrites for a More Politically Correct age” and always identified the HBs as typical middle class youths – just like me! I don’t remember either series having any sort of satisfactory mystery elements, and although I still own a dozen or so of the HBs that I grew up with, I retain them for sentimental reasons and will never re-read them. I only recall that I read one of the Three Investigators novels and that my reaction was favorable. I don’t know why I never found any more of them, but of all the series, this is the one I would want a chance to read. I read a lot of YA – or at least I did until my focus became almost strictly GAD. But what on earth does “MG” stand for? MG stands — in my understanding of age-related parlance — for Middle Grade, which I believe to be about the same age as YA is considered. Why are there two acronyms? Who knows? Not I.
I’ve started the book I’m featuring next Tuesday and I already want to read more of the series that’s from…but, man, they seem to be hard to track down (for sensible money — a post coming on Saturday about that). You did not know HSK ? He was regarded as the looniest mystery writer of USA ! Your mentioning Harry Stephen Keeler reminded me of Ramble House. What has happened to it ? The website seems to have gone ! No idea — the books seem to be available still, so maybe Fender is content to let them sell through other websites; pure surmise on my part, however. I’d like to know where you’re seeing those Ramble House books still available! I have been trying to round out Norman Berrow’s Inspector Smith books and I had to pay a frankly embarrassing amount to do it! The only Berrows I see for non-exorbitant prices are 3 Tiers of Fantasy and Don’t Jump Mr Boland; presumably those are ones with stock still left. I thought there was something posted here half a year or so ago about Ramble House not continuing. A real shame. Yes, also the ebooks available for only 6 dollars at Ramble House…….where are they now ? The ebooks are $9 at that link, I’m afraid, but at least they’re available…! No, only for some books, not all ! For example, no ebooks for Rupert Penny, Hake Talbot, Virgil Markham, E C R Lorac, , Max Afford and many others ! Oh, okay — I hadn’t checked them since I buy the paperback versions. Perhaps we should start panic-buying in case they’re about to disappear from circulation, eh? And Fender Tucker has also stopped replying to emalis ! Thanks! Though, I am not sure about using that site. I did a search on it and was put off slightly. However, it may be the best option… I remember the message on the Ramble House website I think seeming very final. It seemed to me that he didn’t want to deal with publishing or emails anymore. I can vouch for the site — I’ve ordered well over 30 books from Lulu and it works pretty smoothly. Not the most pleasing of interfaces to look at or use, but I wouldn’t provide the link if I wasn’t happy to use it myself. I’ve read a bunch of these and don’t recall any “casual racism” — most likely because every character in the books is a white person. I think the real reason these books got revised every 10 years is that they are marketed to young people and the publishers are desperate to avoid any whiff of old timey-ness. As you noted in the drawings reproduced, which have 1950s cars, not 1930s cars. Anyway, the publishers seem to have given up on trying to keep original Nancy and chums even remotely relevant. In 2006 they introduced a new series called “Nancy Drew and the Clue Crew” where eight-year old Nancy and her BFFs live the good life in the 21st century. You may have heard of the author: Carolyne Keene. LOL, the author’s name of the new series is exactly the same — I typed it wrong. People come and go, trademarks are eternal. 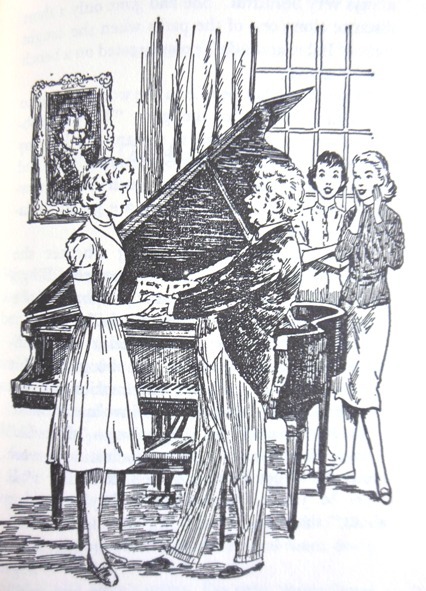 I read quite alot of Nancy Drew when I was young, and my preference for the Nancy Drew Case Files – as opposed to the Hardy Boys series, or even the regular Nancy Drew series – probably telegraphed my subsequent enthusiasm for the Golden Age puzzle-mystery. From my recollection, the Case Files were better clued and constructed. Hey JJ, the good news is – the Nancy Drew Files should be available under £5 per title via Amazon Uk Kindle. If you get down to dipping into this series, I would recommend trying out something within the first 40. The series seems to get more romance-y in the later volumes. From vague (and I mean my 10-year-old) recollection, “Pure Poison”, “Trouble in Tahiti” and “False Moves” were. Till now I can still recall part of the solution to “False Moves” – and it was largely fairly-clued. But there was, JJ! It’s just that nearly all of the early books are completely forgotten except by those who collect juvenile series books. Nancy Drew and all the rest of the now iconic Stratemeyer Syndicate juvenile series characters were the creation of a pulp magazine publisher who was only building on already successful juvenile adventure and mystery series that he began at the turn of the century, those were of course modeled on adult series characters like Nick Adams. Prior to Nancy, Tom Swift, Joe and Frank Hardy there was Dave Dashaway, Dave Fearless, and Bomba the Jungle Boy in the boys’ books and the Motion Picture Girls, Poppy Ott, and Linda Carlton (a girl pilot!) for the girls. That’s just a sample off the top of my head. All of these characters first appeared between 1915 and 1929, some lasted into the early 30s. Bit of trivia: Some of the titles for the Three Investigators books came from the Leo Edwards’ kid’s books: Jerry Todd & the Whispering Mummy, Poppy Ott & The Stuttering Parrot, for example. Wow, there you go; I had, perhaps unreasonably — and definitely in purest of ignorance — assumed that these sorts of tales for boys n girls would be more in the comic-strip adventure style…yer Dan Dares and Flash Gordons and precursors thereof. Yes, I’m probably getting my eras all wrong, but that’s my point — I made an assumption based on probably all manner of incorrect impressions. The existence of this earlier type of YA stories is a rabbit hole I daren’t even peek into at the moment, lest I vanish over the edge with a mild squeek and no-one sees amnything but the soles of my shoes disappearing down into the darkness. But I’ll admit to being very curious, and I thank you for bringing these to my attention. Nick Adams?! He was a movie star. (Ugh, I’m a mess) I meant Nick Carter who was first known as Nicholas Carter – the original detective hero of 19th century dime novels, long before pulp magazines and paperbacks took over the market. Not to get your hopes up, but many of those juvenile series I cited above do not follow the structure of detective novels with a crime or mystery to solve. That’s what I meant by “built upon” the older characters. They tend to be action oriented adventure stories with some trace elements of thrillers, but obviously toned down for a children’s reading audience. Jerry Todd and Poppy Ott perhaps come closest to what Nancy and Joe and Frank are best known for. But the detection as such is very rudimentary compared to the kids’ books published between the late 1930s and the mid 1950s which are more closely aligned with true adult detective fiction. Reading your take on these books has got me digging through my small collection of juvenile mystery books. I hope I can unearth up my copy of …The Whispering Mummy to see if the plot is similar to the Three Investigators title. Also, you and TomCat got me to track down and purchase a Ken Holt novel. I went with The Vanishing Magician because the use of stage magic is one of my favorite plot motifs in both adult and juvenile fiction. Oh, sure, thanks for the clarification but I didn;t hold out much hope of them being detective-y stories — I put them in that similar Dan Dare-ish bracket with much more Adventure backgrounds. I remain incurably curious about the origins of things, however, and would be fascinated (perhaps in a few years, when I have more time!) to see some of those roots. I’d be fascinated to learn — should you be able to find it — whether Whispering Mummy does have anything in common with the 3I title…not least because I have a review of that book due tomorrow. As for Ken Holt: I completely understand the appeal of the one with ‘Magician’ in the title — that was one I went looking for whilst reading Phantom Car, for exactly the same reason you picked it. Right now, I’m just going to keep an eye out for any of them at all, but that’s one I’m very eager to see the Epsteins apply their brand of informed YA fiction to.